HAMILTON — Wide receiver Ricky Collins Jr. was acquired by the Hamilton Tiger-Cats on Friday night in a trade with the Saskatchewan Roughriders. Hamilton also got a seventh round pick in the 2018 CFL draft. Saskatchewan received defensive end Mike McAdoo and a sixth round pick in the 2018 draft in return. The 25-year-old Collins has appeared in 15 games with the Roughriders over the last two seasons (2016-17), making 48 catches for 720 yards and two touchdowns. He also returned eight kickoffs for 151 yards (18.9 average) and five punts for 42 yards (8.4 average). 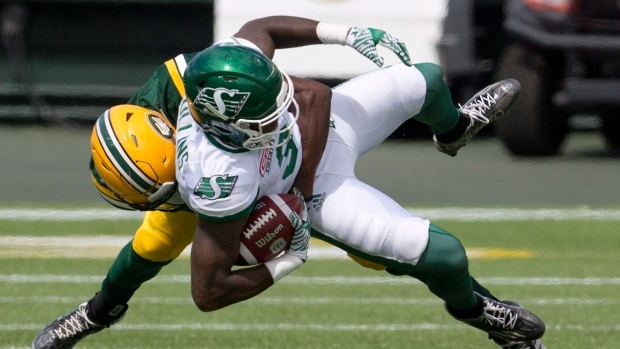 Before joining the Roughriders, the six-foot, 198-pound Collins had a brief stint with the Winnipeg Blue Bombers in 2016 and spent time with the NFL's Green Bay Packers in 2015. The six-foot-seven, 250-pound McAdoo has spent the last two weeks on the Tiger-Cats' practice roster after signing with the team Aug. 7. The University of North Carolina product has had previous stints with the NFL's Baltimore Ravens and Dallas Cowboys since turning pro in 2011. McAdoo, 27, also played two games for the Blue Bombers in 2013, registering one tackle and one quarterback sack.